My sons LOVE huge machines...dozers, trash trucks, cranes, dumpers, you name it, they love it. 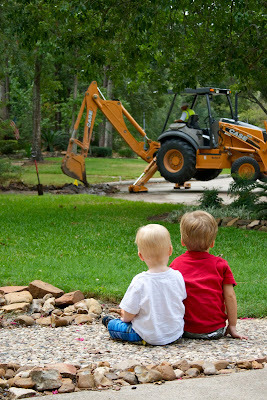 Imagine their pure delight when we came home today to find a yellow dozer right out front. Bummer for our neighbors, who have a broken water line. But major bonus for my boys who got to watch the action up close! My only question for the dozer man? How do you expect me to proceed with naptime while you work?! Looks like today will consist of two very tired boys spending their "naptime" standing at the window watching the dozer's every move. I won't complain, though, because they just look too darn cute in their dozer excitement. I'm so glad my camera was nearby today....it is not often that I can capture them sitting so close together and so perfectly still. They are too cute! My boys would be doing the same thing :) Too bad you aren't closer and they could come over and ride the tractor or combine...my boy's favorite past-time! Something about boys and big machines :) That's a pic you will treasure for years to come!